Expansion Rack For Phonitor 2, Monitor Controller from SPL. The main function of the new SPL Rack Expansion is to allow users to install their Phonitor 2 headphone amplifier into a 19” 2U rack. But with the additional 4 stereo outputs that can be switched via a dedicated control, you can get a full monitoring controller for headphone and speakers. Inputs and outputs are available in XLR format. The Expansion Rack does not include the Phonitor 2, which must me purchased separately. 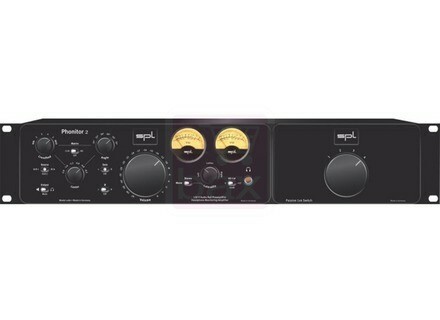 More info soon at spl.info about this new Expansion Rack. [Musikmesse] SPL Iron compressor announced Along with the Creon monitoring controller, SPL will unveil at Musikmesse this month a new bus and mastering 2-channel compressor called Iron. [Musikmesse] 3 new Golden Age Project PRE-73 Golden Age Project will launch in May three new versions of its legendary PRE-73 Class A mic preamp, which will be introduced at Musikmesse. The Radial J48 DI now in stereo version Radial Engineering announces a stereo version of its J48 active direct box, which is phantom powered.